Another Redhill testpiece "The Sound of Violence" 8A, got the treatment this month. Edvinas Šmigelskis kicked things off with the third ascent after Greg Streatfield worked out a static way of doing the crux dyno. Dominic Riordan, Shaun Harris and Greg were aboard the send train a few weeks later and all sent on the same day! A video of the opening ascent by Marijus Šmigelskis can be seen here. Greg also sent "Elfen Lied" 8A and Shaun did the reverse of the same problem, called "The Untitled Symphony of Self Destruction" 7C+. Marijus also did the second ascent of "Entropy" 8A+, the low start to "Chaos". With the warm summer months approaching, Andrew Wood made a fairly hassle free repeat of the classic Classroom testpiece "Swim Coach" 7C+, before the heat makes the sloper crimps much harder to hold. In between burns on "Koeberg", Marijus Šmigelskis has put up a bunch of quality new problems at Bonnydoon in Topside, the best of which are probably "7 Mouths, 8 Tongues" 7A and the easier right hand finish to "The buoyancy of Citrus" which has been named "Enhanced Coziness" 7C, after the grip on Andrew Wood's new toothbrush. Emile Esterhuizen and friends have been busy developing a new area in the Southern Cederberg, North of Ceres. The area has been named "Houdenbek" and has loads of potential for hundreds of problem. 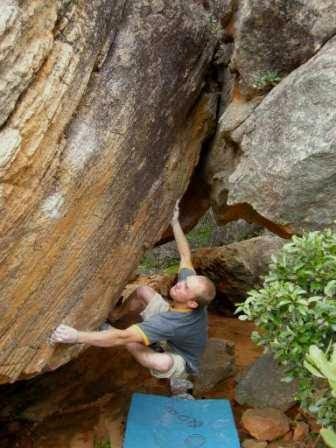 So far, the hardest one there is "Bear Grylls" 7C, established by Marijus Šmigelskis. Topos and details are available on facebook.com on the "Houdenbek Bouldering" group page. At Rocklands the season seems to be drawing to a close. However, Jon Reading managed to send "Caroline" and "Rooi Klavier" both 7C, and Karen Varga sent "Dirty Lies" 7B. Julia Chen made a fast send of "The Fin" 7A at Kleinfontein after a trip back to the car to get a better toe hooking shoe and Dale Posthumus put "Jaws" 7C to rest.